This is a true story that happened to me when I was a high school junior and now I am 23 but I still get shrivers when I remember it. 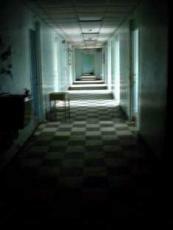 The school had a building that was supposedly haunted by a principle who was there during 1800s. For some reason, she was very attached to the school and was staying there after death. Occasionally people have reported seeing her in the building. One day me and four other friends decided to explore the building during a break and went there. We went to the very top floor of the building and met a senior their who said she was exploring it as well. She lead us through a closed wooden door into a dark dusty room which had a spiral staircase in the middle going upwards to another hidden floor. Me and my friends went up the stairs while the senior girl lead us. The stairs ended at an elevator which looked so green, spooky, and uninviting none of us wanted to get in. The senior girl opened it and got in and urged us to come in but none of us had the guts do so. She laughed at us calling us wimps and closed the elevator. By now as mere 16 year olds we were frozen with fear that we all ran down the stairs, out of the door, and out of the building. We didn't even bother to check if that girl came out from the elevator. Two days later we come back to school to find out that a girl was discovered in an elevator dead. They assumed the elevator malfunctioned and got stuck so she starved in there to death. You won't imagine how scared we were when we found out it was the girl that was with us two days ago. I don't know if the elevator really got stuck, or something else killed her since they tried to reduce publicity to the story as much as possible and that section of the building was labeled off limits to students and teachers. I still remember this story so good because it had that much of an impact on me. I can assure you that this story is 100% true. © Copyright 2019 Debasis Bar. All rights reserved. That kind of spooked me a little ...made me look behind me. Good job! Thanks. I Have Another 5 Stories. This page was created in 0.3232 seconds.